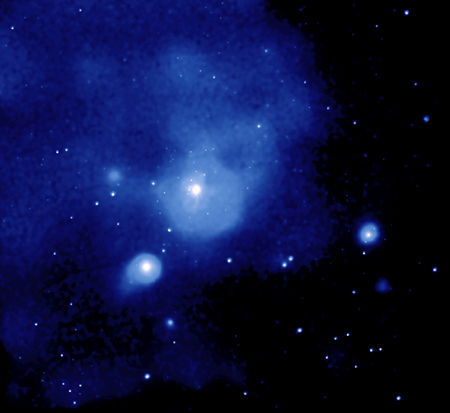 Fornax Cluster: A nearby galaxy cluster about 65 million light years from Earth. Caption: Chandra's mosaic of images of the Fornax cluster reveals that the vast cloud of ten-million-degree Celsius gas in the core of the cluster has a swept-back cometary shape that extends for more than half a million light years. This geometry suggests that the hot gas cloud is moving through a larger, but less dense cloud of gas that creates an intergalactic headwind. The core motion, combined with optical observations of the motion of a group of galaxies falling toward the core, indicates that the cluster lies along a large, unseen, filamentary structure composed mostly of dark matter. Most galaxies, gas, and dark matter in the universe are thought to be concentrated in such filaments, and galaxy clusters are thought to form where the filaments intersect.